The European Union (EU) is a strong advocate in the fight against climate change and the transition towards a cleaner, less polluting energy system. Having taken over the chairmanship of the Mission Innovation Steering Committee in February 2017, the EU is a fully committed partner to the global endeavour of Mission Innovation, representing a key vehicle towards accelerating global clean energy innovation and achieving a clean energy which is widely affordable. Security, solidarity and trust: Diversifying Europe’s sources of energy and making better, more efficient use of energy produced within the EU. A fully-integrated internal energy market: Enabling energy to flow freely across the EU without any technical or regulatory barriers. Energy efficiency: Energy efficiency first – it will reduce our dependence on energy imports, whilst reducing emissions. Climate action – decarbonising the economy: Supporting ambitious climate policy as an integral part of the energy policy and fostering EU global leadership in renewables. Research, innovation and competitiveness: Supporting breakthroughs in low-carbon technologies by prioritising research and innovation to drive the transition of the energy system and improve competitiveness. The shift to a low-carbon energy system, and the even broader decarbonisation agenda inherent in the agreement reached at COP21 in Paris, is perhaps the biggest transformative project of the twenty-first century. It is fitting therefore that research and innovation plays a key role in the Energy Union strategy, as one of its five core dimensions and contributing to the other four. By the end of 2016, the European Commission presented its Clean Energy for all Europeans package containing a set of legislative proposals and a set of actions to Accelerate Clean Energy Innovation, targeting three overarching goals: (i) energy efficiency first, (ii) Europe as a leader in renewables, and (iii) a fair deal to consumers. The 20 actions to accelerate clean energy innovation are addressing economic incentives, regulatory bottlenecks, private investment, European funding in key priority sectors, as well as reinforcement of international cooperation. On the later, the engagement of the European Commission to play a leading role within the global Mission Innovation initiative on behalf of the European Union is among the key actions. This engagement will represent the major input of the European clean energy research and innovation to the Paris Agreement and will have a specific focus on leveraging private investments. The European Union (EU) is deeply engaged in the Mission Innovation Challenges, where it has expressed its commitment to engage in all challenges and co-leads two of them: the Converting Sunlight into Storable Solar Fuels Innovation Challenge, and the Affordable Heating and Cooling of Buildings Innovation Challenge. These will be key areas of interest for the EU, where it seeks to identify gaps and opportunities for researchers, innovators and investors, and to foster international collaborations that will lead to the development of new innovative clean energy technologies and solutions. The EU is fully committed to developing breakthrough energy innovation in the framework of the Converting Sunlight Innovation Challenge, which the European Commission (EC) co-leads alongside Germany. The objective of the Converting Sunlight Innovation Challenge (IC5) is to stimulate international cooperation and exchange in this area, with the ultimate goal of discovering affordable ways to convert sunlight into storable solar fuels. The current energy demand is primarily met through burning fossil fuels such as coal, crude oil and natural gas. Not only is this situation currently unsustainable, but as energy demand is foreseen to increase to meet global needs, the continuous use of fossil fuels to satisfy this demand is simply untenable given our common goal to keep global warming well below 2 degrees Celsius, as set out in the Paris Agreement. Producing carbon-neutral clean fuels and developing breakthrough energy storage chemicals will not only contribute to mitigating climate change, they will also serve to enhance energy security and will provide opportunities for economic development across the globe. By co-leading this challenge, the EC is fully committed to the development of new technologies that can deliver sustainable ‘solar’ alternatives to fossil fuels and meet the current energetic demand. In this context, Artificial Photosynthesis (AP) is amongst the most promising new technologies and is often considered as a potential ‘game changer’ technology in the fields of energy conversion and energy production, becoming thus a key area of interest for the EU energy research and innovation programmes. Europe occupies a frontline position in AP research, with 60% of the estimated 150 leading global research groups located in Europe. Moreover, over €30 million have been spent in the field of AP under the EU’s research and innovation framework programme between 2002-2013, with 20 projects almost all related to the topics of photoelectrocatalysis (55%) and synthetic biology & hybrid systems (44%). The EC is also committed to other alternative means to convert sunlight into storable solar fuels, such as through high temperature thermochemical pathways, where Europe is also a key player. Design and engineering of devices for the production of energy rich chemicals. The European Commission also co-leads the Affordable Heating and Cooling (H&C) of Buildings Innovation Challenge, along with the United Kingdom and the United Arab Emirates. The ultimate goal of this Innovation Challenge is to make low-carbon H&C affordable for everyone, through the development of systems and measures to provide affordable solutions for the decarbonisation of the H&C sector and through the promotion of increased cooperation among the Members within the Challenge. Heating and cooling is a standing policy priority for the EU, making this Challenge coherent with one of the EU’s top energy concerns. H&C represents 50% of the final energy consumption in the EU and is the largest energy end-use sector, ahead of transport and electricity. 75% of Europe’s H&C needs are supplied by fossil fuel (gas represents 67% and most of it is imported), whereas renewable energy sources supply less than 20% of H&C needs (18%). H&C affects each and everyone’s daily comfort and represents a key element for Europe’s competitiveness. Decarbonising the EU H&C sector contributes to the three core objectives of the EU energy policy: (i) to make the EU economy energy-secure, by reducing the reliance on gas and oil imports; (ii) to make it more sustainable, by reducing GHG emissions and the environmental and societal costs of coal and heating oil; (iii) to contribute to EU’s economic growth, by creating new economic and business opportunities in the EU. The European Commission is addressing the challenge of making the H&C sector more efficient, sustainable and smart through its action at regulatory level and through other enabling actions, in particular research and innovation. In relation to the policy and regulatory framework, following the adoption of the H&C Strategy in 2016, the Commission presented the Clean Energy for all Europeans legislative package highlighting the synergies between energy efficiency and renewable energy. Addressing the potential of renewable energy in the H&C sector is one of the objectives of the review of the Renewable Energy Directive. With the proposals on energy efficiency on the other hand we outline that integrated planning and long term vision are needed to act on the inefficient and old systems and appliances and significantly increase the renovation rate of EU buildings stock; we therefore facilitate refurbishment since it represents an opportunity to modernize the systems and increase the penetration of innovative and renewable technologies in the H&C sector as well. In terms of research and innovation, H&C is part of the European Strategic Energy Technology Plan (SET Plan) priority on energy-efficient systems, with a focus on buildings. Linking electricity and heat sectors or linking industry and buildings allowing the recovery of waste heat are examples of the vision that we have for the H&C sector. H&C is among the selected research and innovation priority for European funding related to the decarbonisation of EU building block by 2050 to Accelerate Clean Energy Innovation and it will benefit from the more supportive policy and financial framework envisaged. Mission Innovation is expected to help building collaborations and partnerships with established key stakeholders, business, investors and innovators in order to increase the industrial exploitation and commercial opportunities for clean H&C technologies. “Horizon 2020” is the EU’s funding programme for research and innovation in the period 2014-2020 with an overall budget of almost EUR 80 billion. Clean energy R&D is supported through a dedicated programme part (Societal Challenge “Secure, clean and efficient energy”), but also significantly in other parts across the programme. 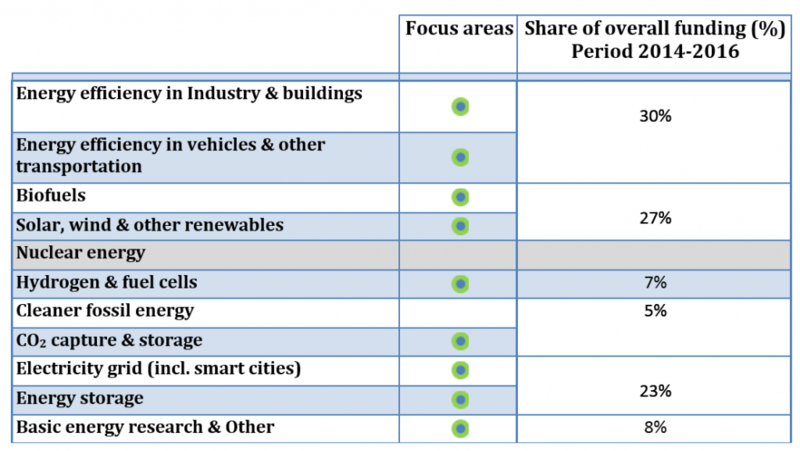 The energy research and innovation priorities within Horizon 2020 are mainly defined by the European Strategic Energy Technology Plan (SET Plan) which represents the research and innovation implementing pillar of the EU’s Energy Union strategy. The key focus areas of Mission Innovation R&D investment do not represent the entire EU’s clean R&D portfolio. All EU clean R&D investment referred to in Mission Innovation relate to research, development and demonstration and not to deployment (i.e. The Technology Readiness Levels covered are between 1 to 8). The energy consumption by industry and buildings accounts for a substantial share of the total energy consumption. The EU, in partnership with industry, is investing in R&D for Energy-efficient Buildings, Factories of the Future, and Sustainable Process Industries. The aim is to increase the competitiveness and energy efficiency of the construction sector, to increase sustainability of production processes and make the process industry more resource and energy efficient. More information is available here. The decarbonisation of transportation, especially road transport, is crucial for reducing greenhouse gas emissions. The EU supports activities targeting cleaner technologies as well as more efficient management and manufacturing processes for different transport modes. More information is available here. Europe’s energy and climate goals require the development of new fuels and mobile energy sources, particularly in the field of transport. The EU supports different bioenergy pathways at different scales while minimising negative environmental and social impacts linked to land use. More information is available here. Fostering the development of renewable energy technologies has been one of the EU’s key priorities in R&D, particularly with regards to photovoltaics, concentrated solar power, bioenergy, biofuels and renewable alternative fuels, wind, ocean energy, geothermal, hydropower and renewable heating and cooling. More information is available here. The EU supports activities on fuel cells and hydrogen (FCH) through the Fuel Cells and Hydrogen Joint Undertaking (a public-private partnership) which covers mobile and stationary FCH applications for use in the energy and transport area. More information is available here. In its strive to achieve the decarbonised power generation challenge by 2050, developing technologies for safe and secure Carbon Capture and Storage (CCS) has become a key area of interest in energy research. The EU supports the full CCS chain for a representative portfolio of different capture, transport, storage and re-use technology options. More information is available here. The upgrade and development of energy networks across the EU is one of the key challenges to securing a sustainable and competitive energy future in the EU. In order to transform electricity networks into ‘smarter’ grids, the EU seeks to develop new components, technologies, and procedures which can respond to the particularities of both the transmission and distribution side of the grid. In this context, Smart Cities and Communities which foster a holistic approach for sustainable and innovative energy solutions are also a key area of interest to the EU. More information is available here. Energy storage is highly strategic for a more efficient use of renewable energy and its higher level of integration into the energy system. Storage can help deal with fluctuations in demand and generation in the electricity system by allowing excess electricity to be ‘saved’ for periods of higher electricity demand. In addition, storage via batteries or other carriers (e.g. hydrogen) allows for the introduction of renewable energy in transport besides biofuels. Finally, storage allows for a more flexible energy system. All forms of storage are supported by the EU. More information is available here. Achieving more efficient and cost-competitive, as well as cleaner, safer and more sustainable energy technologies will be essential to confront future challenges and long term solutions. The EU supports multi-disciplinary research to achieve scientific breakthroughs in energy-related concepts and enabling technologies. More information is available here and here. Average of the period 2013-2014-2015 as a reference for the doubling. Sectors of clean energy R&D covered are renewable energy technologies, energy efficiency, energy system (smart grids, energy storage), carbon capture storage and use, and fuel cells and hydrogen. The Technology Readiness Levels covered are between 1 to 8 (i.e. these funds do not include deployment).